Tundra Books, Penguin Random House, 2018. Originally published in French in 2016 in Canada. 76 pages. Ah! A wonderful 2018 children’s book for which I can post a review! Why? Because it’s translated from French and was originally published in Canada in 2016 – so it’s not eligible for the 2019 Newbery. I probably wouldn’t have read it, but it’s a picture book. I’m glad I did because I was enchanted. The Pink Umbrella is the story of Adele, who runs a café called The Polka-Dot Apron in a small village next to the sea. a small lantern always lit. It’s where everyone meets. Where they cry, laugh, yell, argue and love. The café is the heart of the village. And Adele is the heart of the café. She is the village’s sun – lively, sweet and sparkling. The thing everyone knows about Adele is that she doesn’t like the rain. When the weather is nice, she smiles, she whistles, she sings at the top of her lungs, she throws open the windows and props open the door…. But when it rains, Adele stays inside. She can’t help it; she loses her spirit. The rain is gray, cold and dreary. However, one beautiful market day on Wednesday (the café has many uses besides being a café and Wednesday is market day), someone leaves behind two bright pink rubber boots with suns carved into the soles. They are just Adele’s size! She asks all week, but no one claims them. The next week, someone leaves behind a bright pink raincoat. It, too, fits Adele perfectly. But the next market day the weather is bad. Lucas and Adele are taking care of the market stall, but few customers come, so Lucas leaves early. When the truck disappeared from view, Adele turned around to close the café, roll herself up in her quilt and wait for the sun to take the place of the clouds . . . But she stopped short, stunned! In the entrance, under the coatrack, was an adorable umbrella. It was pink . . . with polka dots! And only one person could have left it there. Because the day was done, because she wanted to, and because opening an umbrella inside is bad luck . 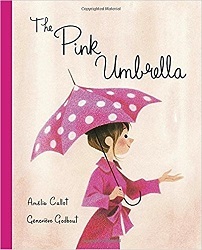 . . Adele put on the boots and the raincoat and, on the doorstep, opened the pink polka-dotted umbrella. There was only one step to take, and she took it with joy. She turned the key in the lock and went for a walk in the rain. It really wasn’t so bad. The air smelled wonderfully of damp grass, and the rain played a pretty melody as it fell on the umbrella. And yes, she sees her friend Lucas as she goes on her walk. I probably shouldn’t have quoted as much from this book as I did, lest you think that’s all there is to it. I wanted to convey the charming language used. But the marvelous old-fashioned pictures are what completely win your heart. They are large and beautiful, cartoon-like but filled with atmosphere. Adele is beautiful and like a ray of sunshine indeed – but all the more so when she’s all dressed in pink, brightening up a gray day. At first, I liked the book so much, I thought it was really written more for adults than for children. But then I thought about how very much fun it would be to read the book to my four- and five-year-old nieces. It’s a book about joy, and a book about love, and a book about getting out in the rain, and a book about the joys of wearing pink! If I were doing a preschool storytime in February, I would enjoy using this book for a theme of love where it’s not overtly stated. Yes, it’s on the long side – but even though there are many pages, most don’t have a lot of words, and the big beautiful pictures will keep a group's interest. But of course, more fun would be sitting down with a child who loves pink, or a child who loves wearing rubber boots in the rain – and reading it together.